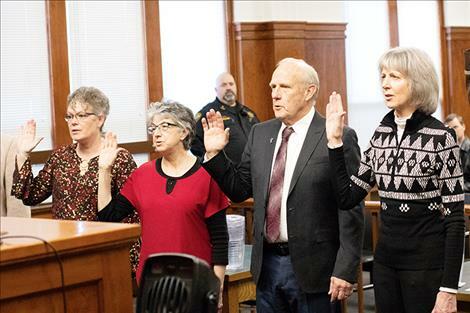 County Treasurer/Assessor Robin G. Vert-Rubel, County Superintendent of Schools Carolyn Hall, Lake County Commissioner Gale Decker and County Clerk and Recorder Paula Holle raised their right hands to take the oath of office on Dec. 19. Judge James Manley stands behind newly sworn in officials, including: Justice of the Peace Randal Owens, Lake County Sheriff Don Bell, Clerk and Recorder Paula Holle, Treasurer/Assessor Robin G. Vert-Rubel, County Superintendent of Schools Carolyn Hall, County Commissioner Gale Decker and County Attorney Steven Eschenbacher. 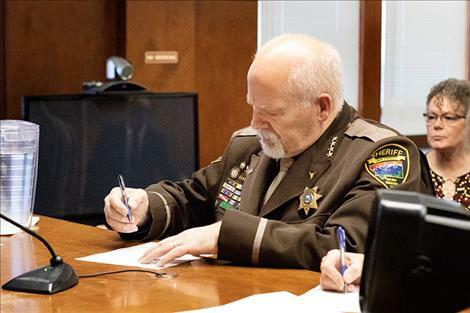 Sheriff Don Bell signs his oath of office. 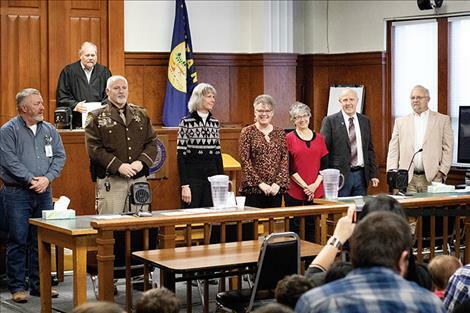 POLSON – Seven recently elected and re-elected Lake County officials were sworn in for their new terms and took their oaths of office Wednesday afternoon. Dec. 19, in the main courtroom of the Lake County Courthouse. Manley said he didn’t know what to expect when he first began his work in public service. He said he ended up learning firsthand that the people working in Lake County government are dedicated, efficient and hardworking. 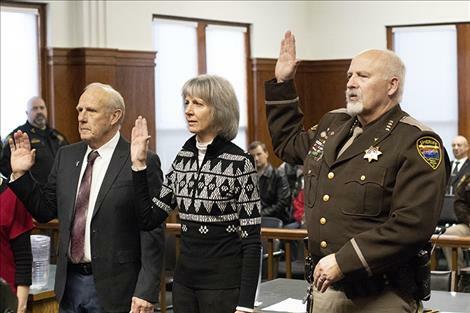 Lake County Commissioner Gale Decker was sworn in for district three. County Clerk and Recorder Paula Holle took the oath. County Superintendent of Schools Carolyn Hall will continue to serve county schools. County Treasurer/Assessor Robin G. Vert-Rubel was sworn in. Justice of the Peace Randal “Randy” Owens will continue to serve. Lake County Sheriff and Coroner Don Bell was re-elected and sworn in along with County Attorney Steven Eschenbacher.